Baby it’s cold out there that means its, time to layer up! The cooler weather means more time spent at home sheltered from the chill. Winter is also a great opportunity to bring out your cosy throws voluptuous velvets and luxe linens. Here are my tips to get you grey Koala Sofa winter ready. During the winter months there is nothing better than a night at home on your cosy Koala Sofa. The best way to cosy up your couch is with layers. 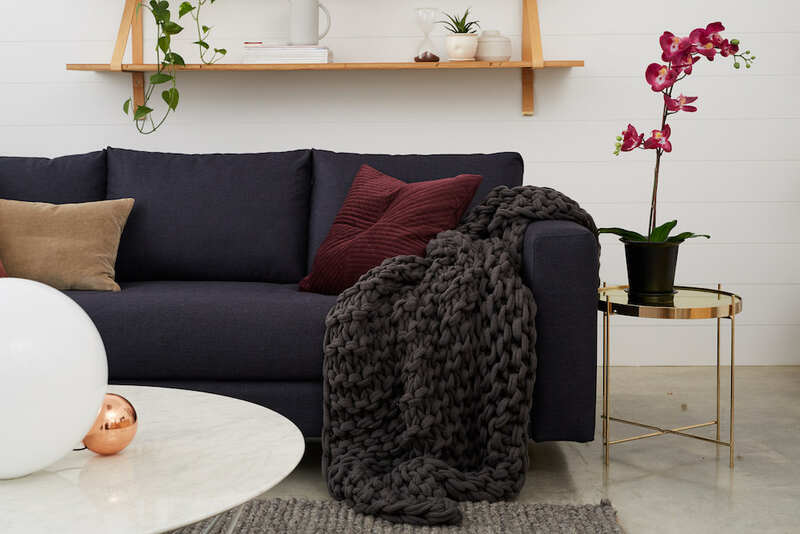 Chunky knit throws, velvets and faux fur fabrics are the perfect companion for those chilly nights. A layered look with different sized cushions in wool,velvet or knit material. A heavy throw or even a fluffy faux fur draped over the arm of your sofa creates an inviting and casual feel. I’m a big believer in more is more during winter, don’t be afraid to add a few different throws in contrasting textures. It’s amazing what an impact changing up your cushions or throws can have on a space. By simply adding cushions and throws in warmer colours the atmosphere of the room can be instantly changed to suit the season. Gorgeous terracotta, dusty pink, and blue will work beautifully against the grey of your Koala Sofa. Dreamy jewel colours like emerald green, and ruby reds work beautifully in velvet fabrics. Deep and rich colours invite you to sink right in. Moody blues and work great with grey especially when paired with a chunky knit or plush wool throw. 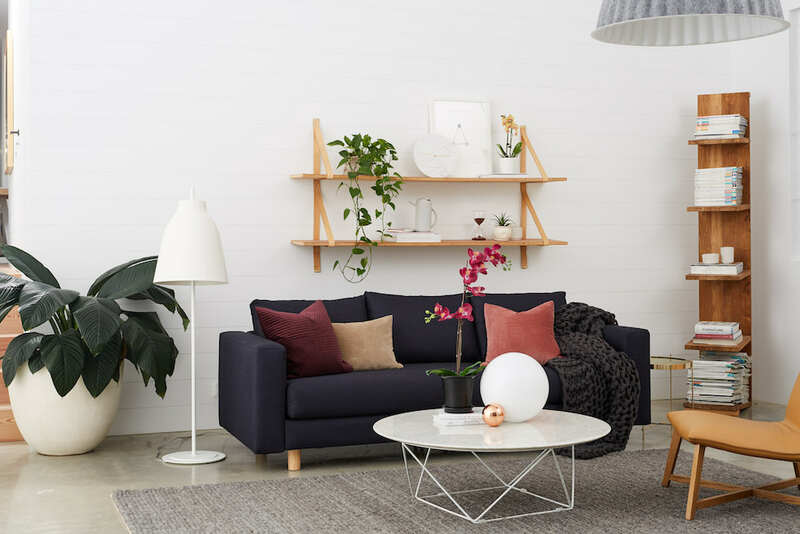 Take a look at Dulux’s Legacy colour forecast for 2019. A stunning balance of rich and bold colours perfect for the the cooler months. If you ask any Interior Designer they will say that the easiest and most affordable way to change the mood in a space is to use lighting. The right lighting during the winter months creates a warm and inviting atmosphere. Tower or floor lamps look great against a sofa and you can easily change the shades to suit the season. A beautiful brass floor lamp with a dim light is a perfect match to jewel toned cushions on your Koala Sofa. An Overarching floor lamp is not only great at creating an intimate atmosphere when placed directly above your Koala Sofa it also works well as a reading light on those cold winter nights in. A short lamp placed on a side table next to your Koala Sofa are also great mood enhancers. 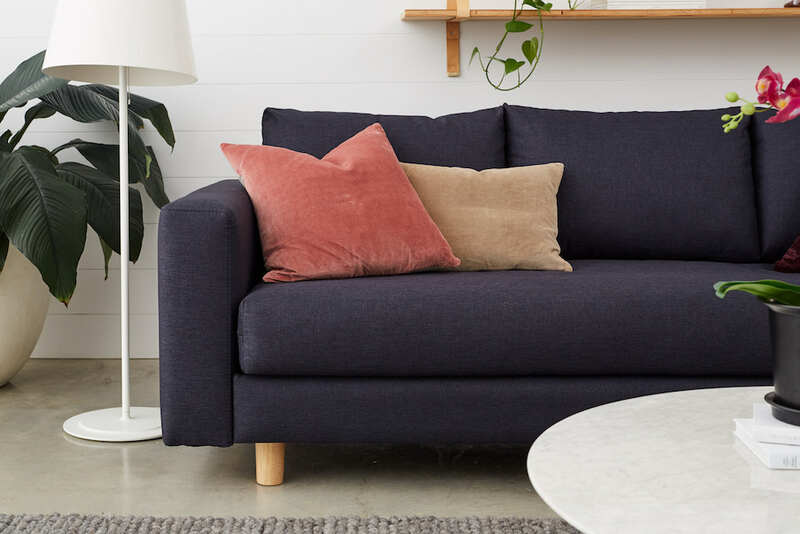 Get your Koala Sofa, and start the 120 night trial today!